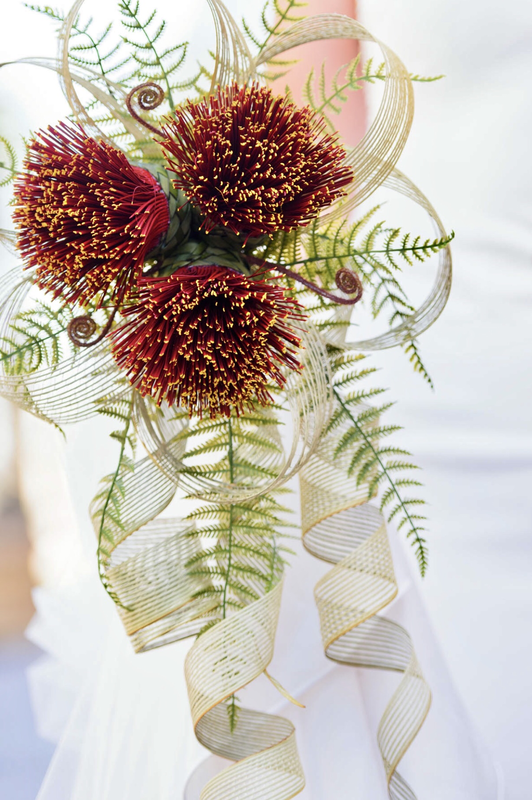 Pohutukawa Trio bridal bouquet $190 NZD. 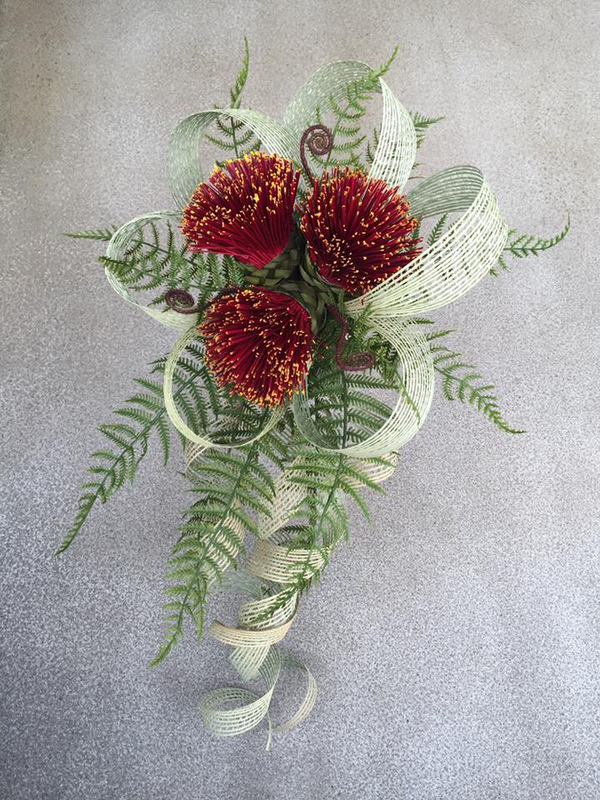 Three large Pohutukawa flowers with large natural netted loops, green ferns & Koru. 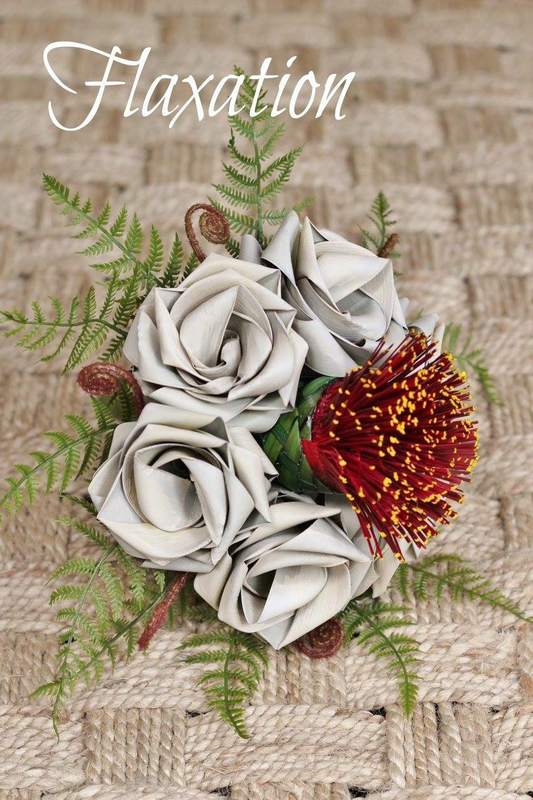 “NZ Native” brides bouquet with three Pohutukawa, four brown woven buds, three ivory woven flowers & two sage woven koru with imitation fern, koru & natural loops $210 NZD. 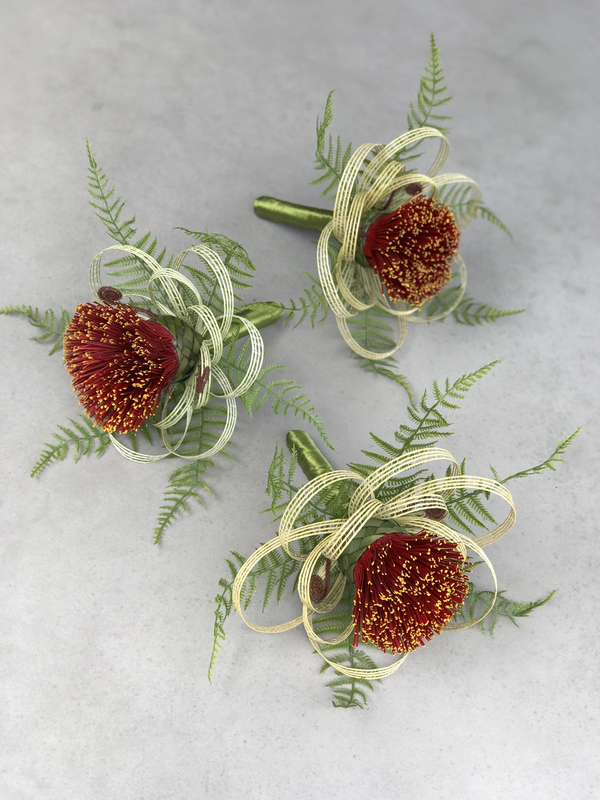 Bridesmaids single Pohutukawa posy with loops, fern & koru $90 NZD each for the large size above or $80 NZD each for the small size below. 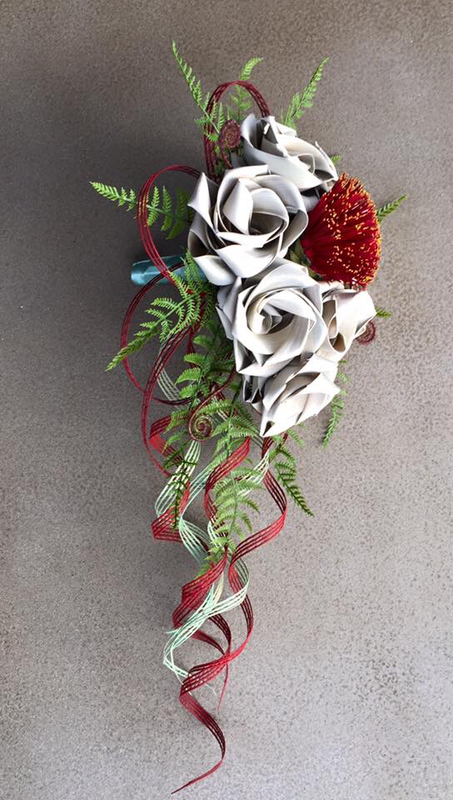 Brides Pohutukawa posy with large red & ivory roses, fern & koru $160 NZD. 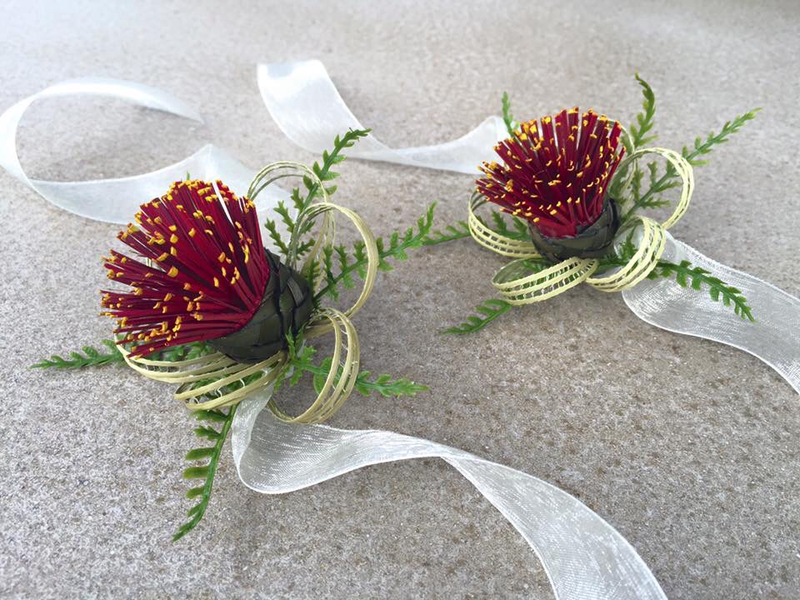 Pohutukawa wrist corsage with loops & fern on an organsa ribbon $35 NZD each. 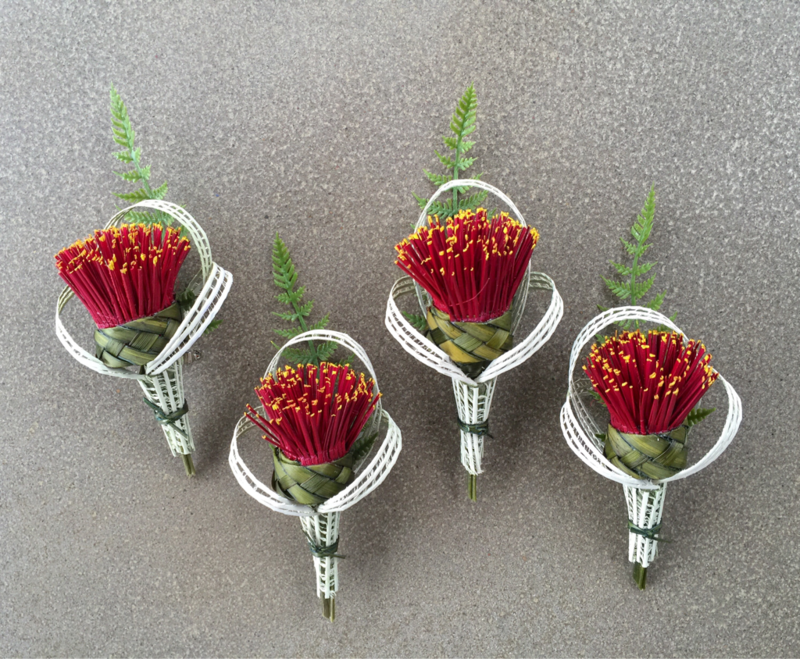 Pohutukawa buttonholes with white loops & green fern $25 NZD. 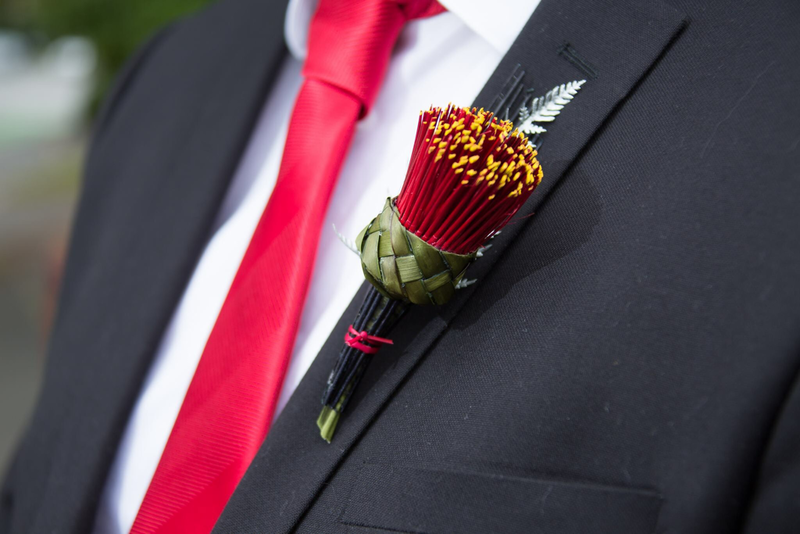 Pohutukawa buttonholes with a black fan $25 NZD. 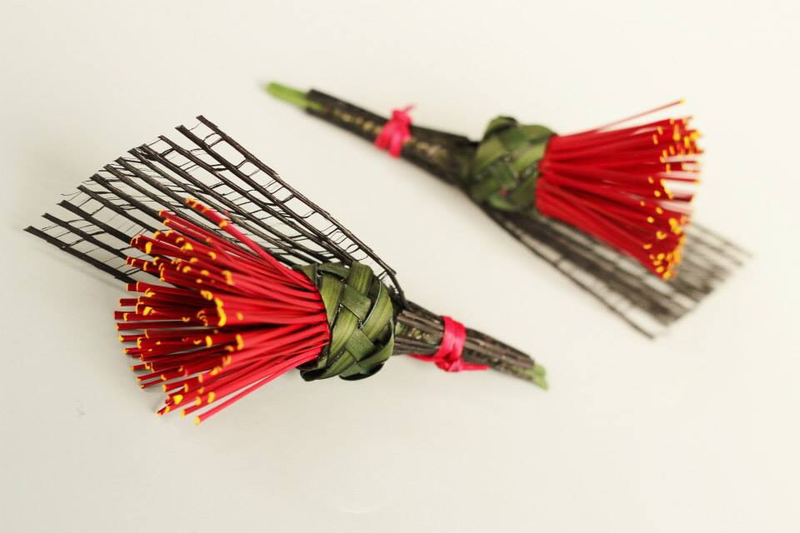 Pohutukawa Tui buttonholes $25 NZD each. 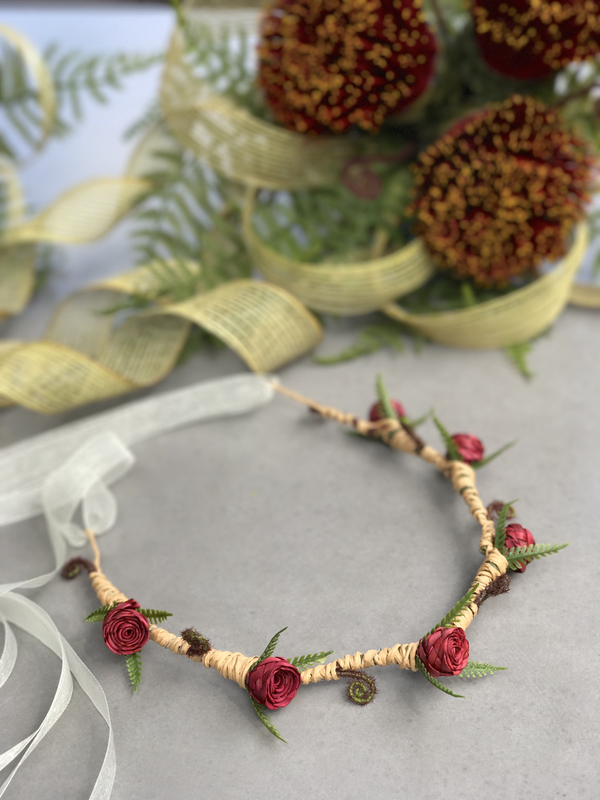 Large Pohutukawa wrist corsage on a bead wrist band with Pohutukawa flower, loops, fern and two ivory rose buds on each side of the Pohutukawa $50 NZD. 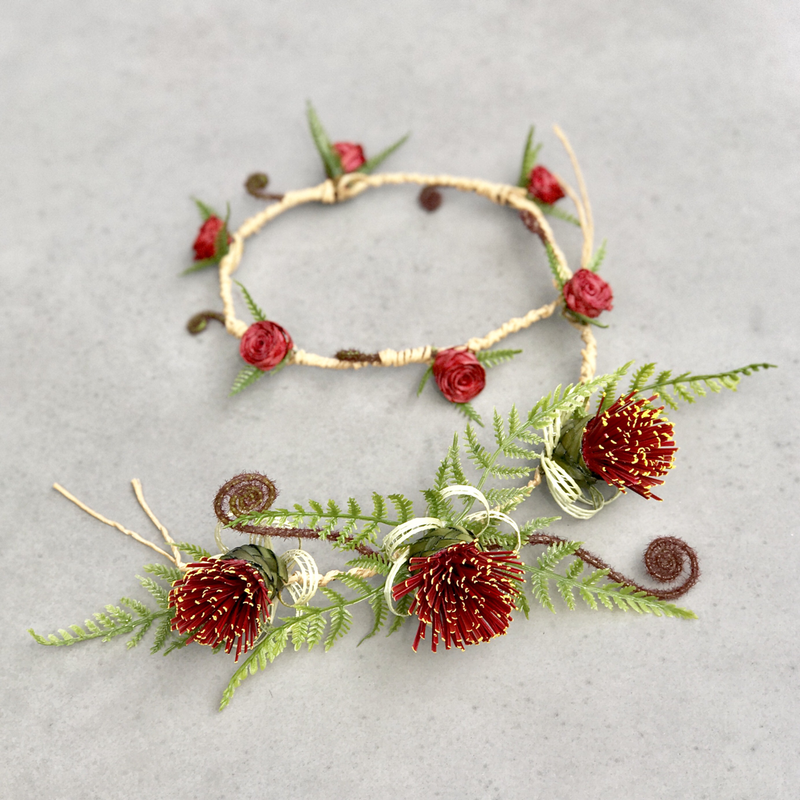 Flower girl native halo with tiny red buds, fern & koru $40 NZD each. 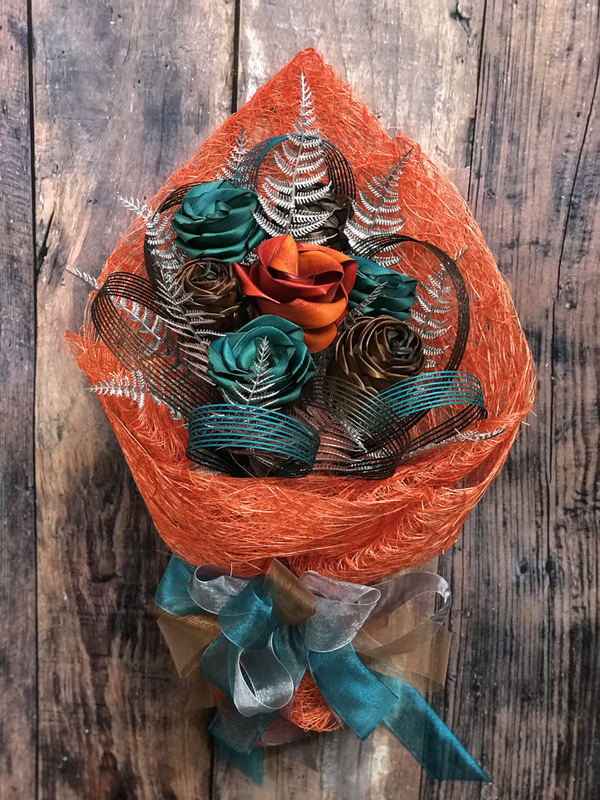 Pohutukawa waterfall bouquet with large Ivory roses, green fern, koru & trailing loops $190 NZD. 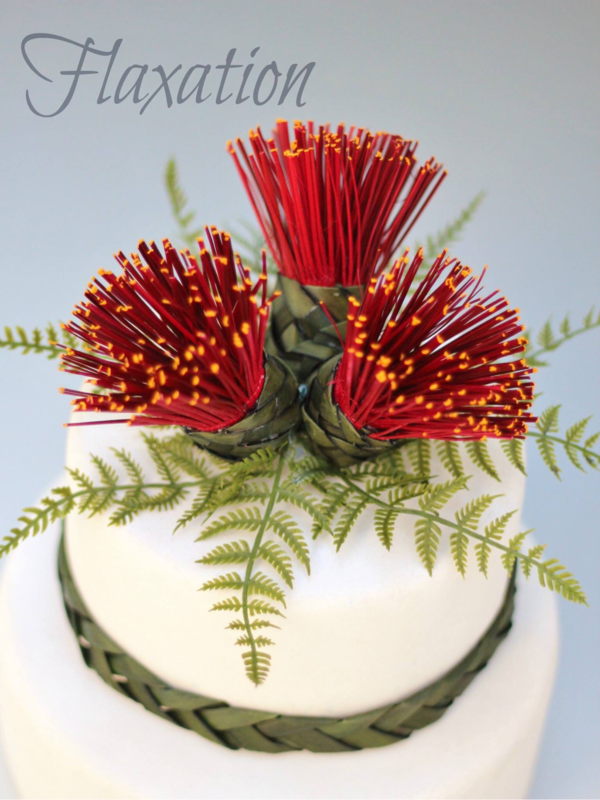 Pohutukawa trio cake topper with green fern $65 NZD. 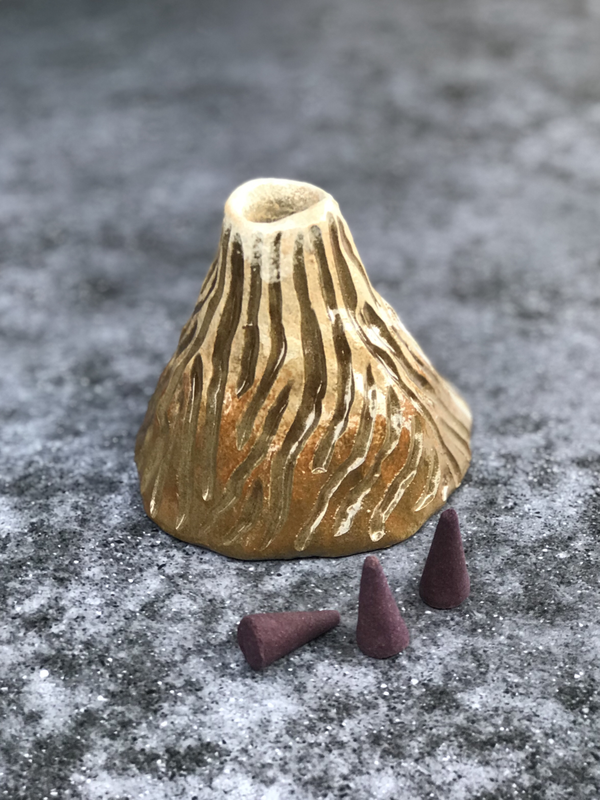 ”NZ Native” cake topper $55 NZD. 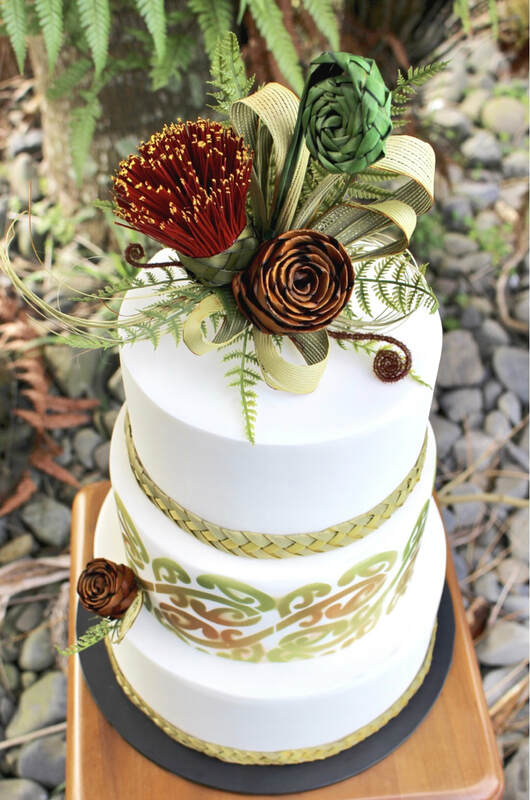 Natural woven cake bands are an extra cost dependent on the cake their sizes. Please enquire. 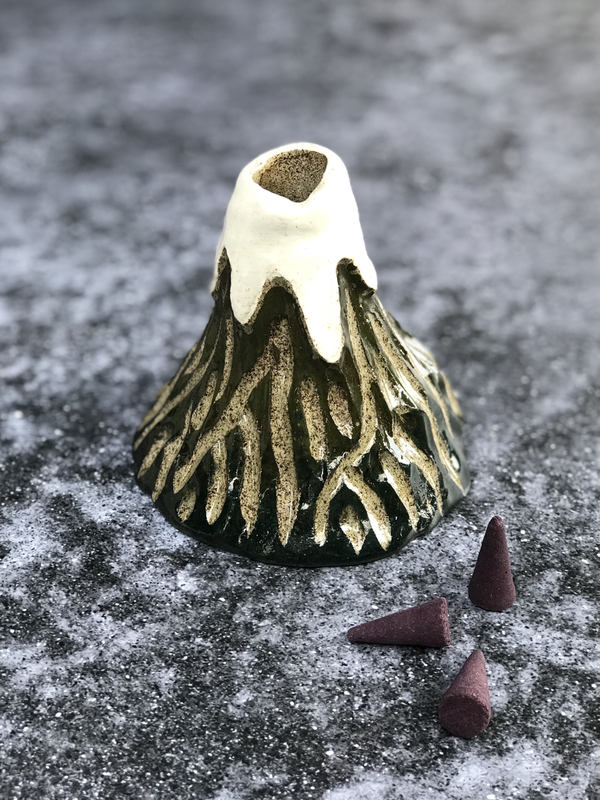 Pohutukawa centrepiece with large silver loops in a ceramic cube (white or black cube) $70 NZD each. Native Pohutukawa cube centrepieces $70 NZD each. This is a design to order hair piece created for a special hairstyle. 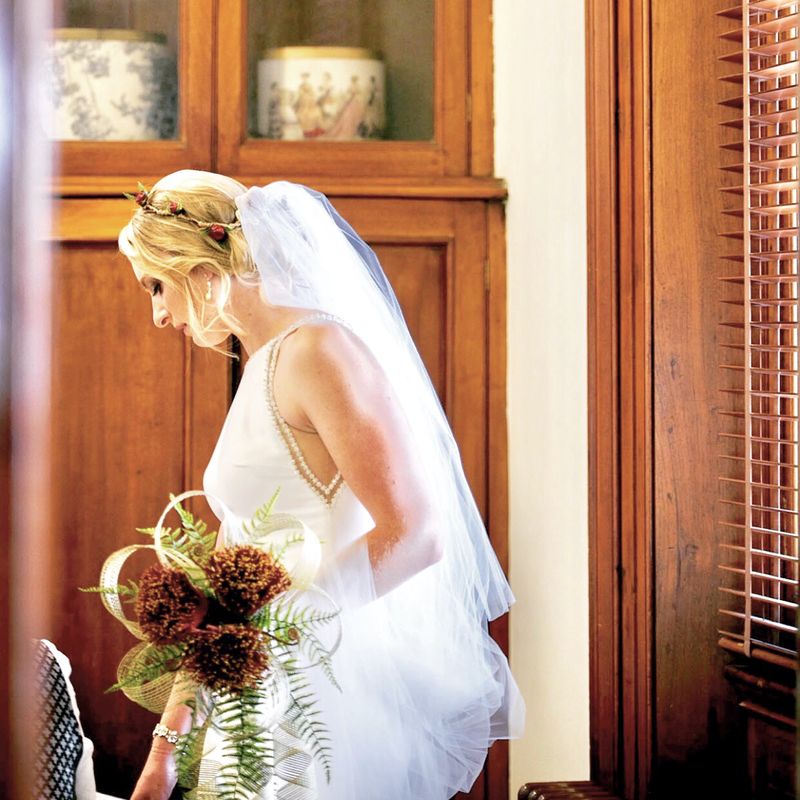 Very excited to create this for our clients special day. Please enquirer with any special requests. Large Pohutukawa front of house arrangement $180 NZD. 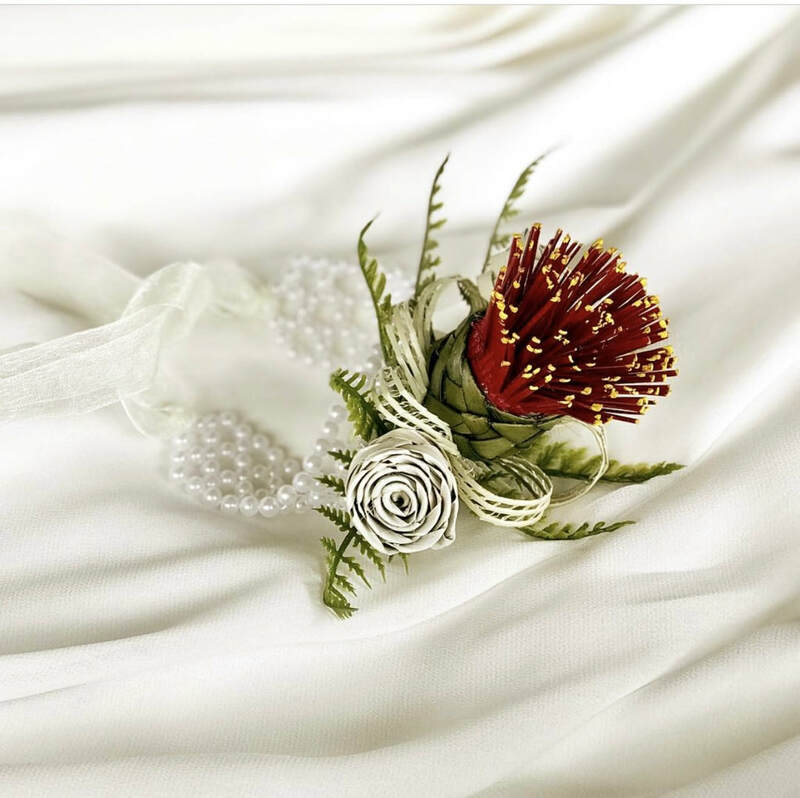 Thistle Trio bridal bouquet $190 NZD. 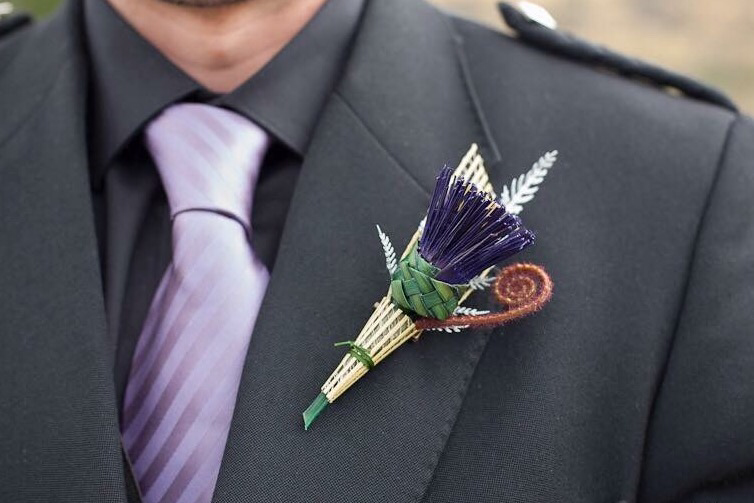 Thistle buttonhole with silver fern, koru & natural fan $25 NZD. 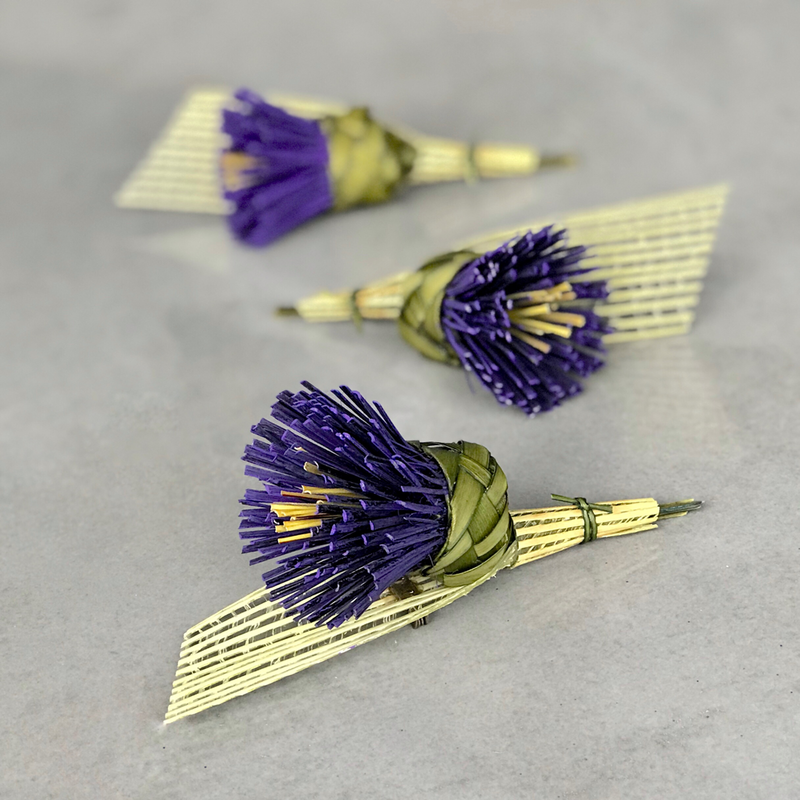 Thistle buttonhole with natural fan $25 NZD each. 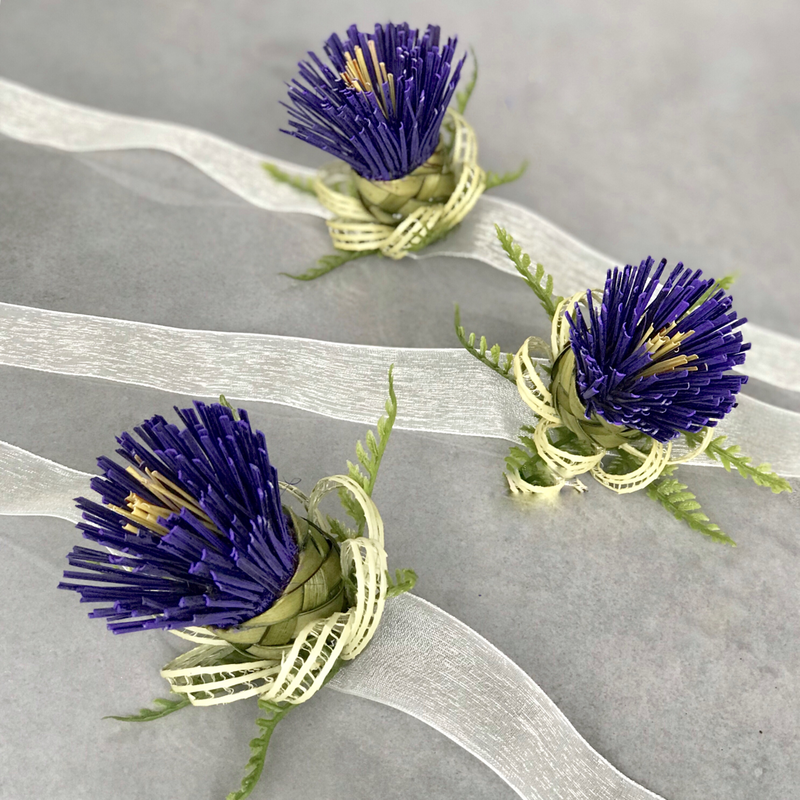 Thistle wrist corsage $35 NZD each. 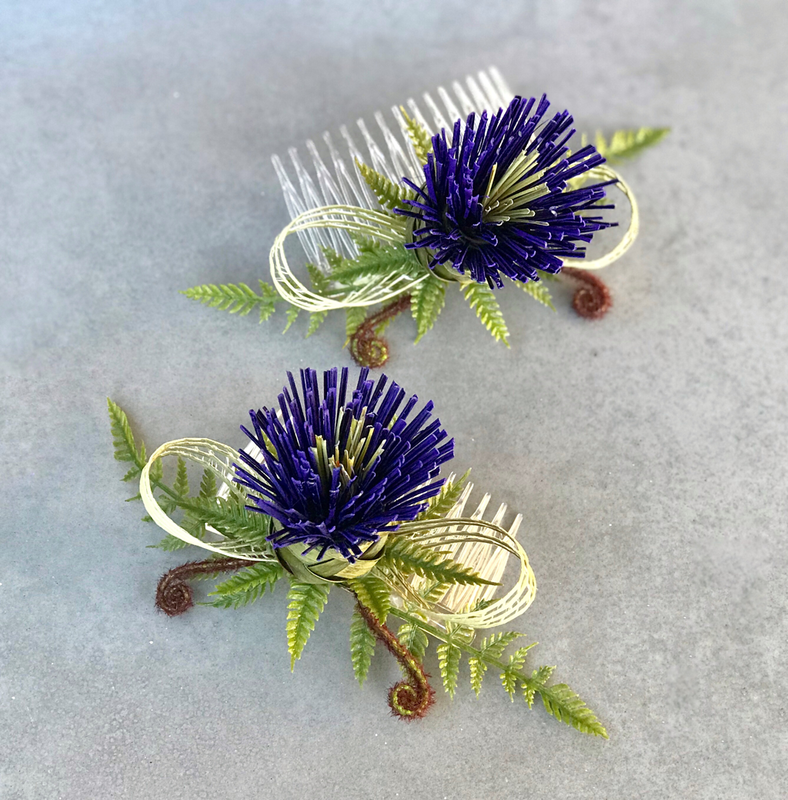 Thistle haircomb $40 NZD each. 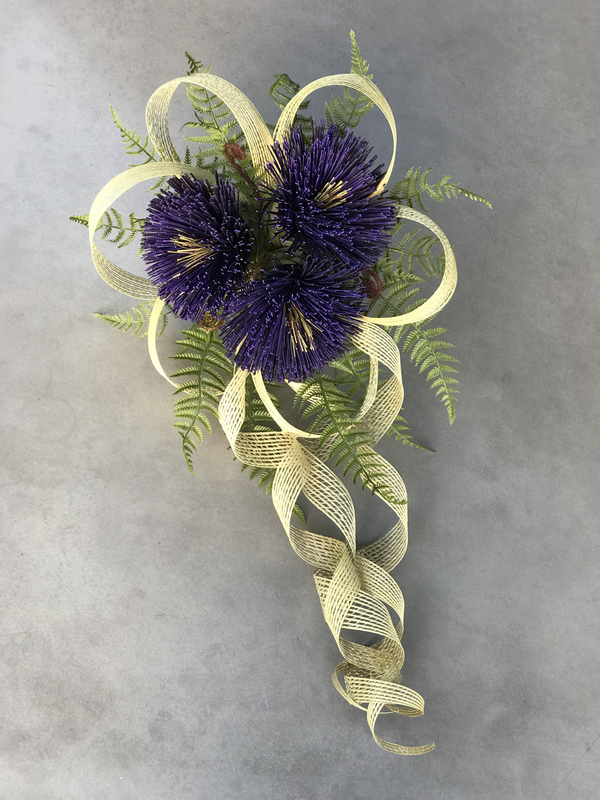 Thistle single flower upright posy with natural loops Small $65 - Medium $75 NZD. 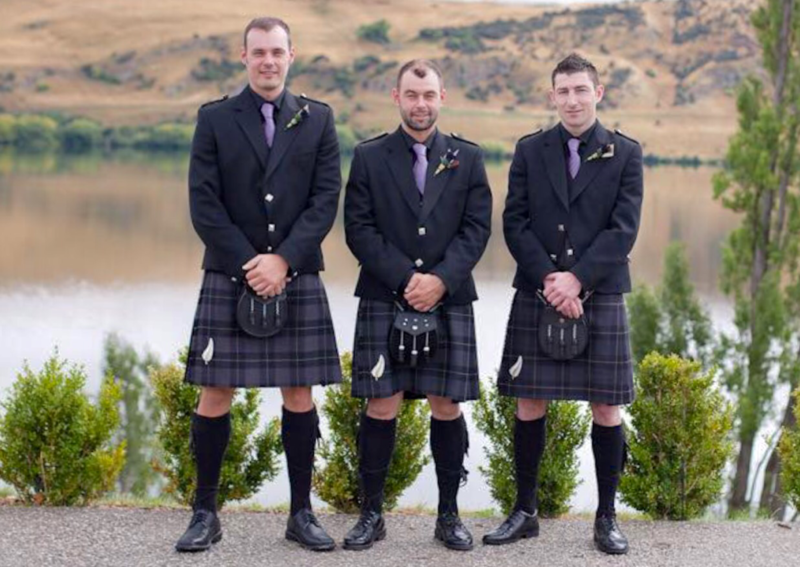 Please note - all of our Pohutukawa styles can also be created with the Thistle as another option.